President Barack Obama said Friday afternoon that “we are now deeply concerned about reports of movements taken by the Russian Federation within Ukraine” and “there will be costs” to any military intervention. 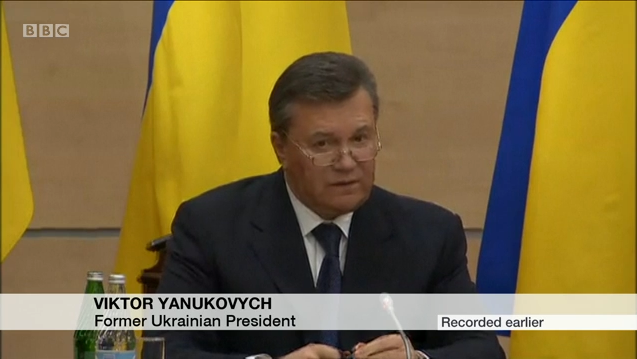 Any violation of Ukraine’s sovereignty would be “deeply destabilizing,” he said at the White House. His comments came as tensions escalated in Crimea, a Ukrainian peninsula located in the Black Sea. It is an autonomous republic with its own parliament and a mostly ethnic Russian population that formed part of the support base for ousted Ukrainian President Viktor Yanukovych. After his removal from office Feb. 22, Yanukovych surfaced in Russia Friday and said he is still the “legitimate president” of Ukraine. “I intend to continue the fight for the future of Ukraine against those who, with fear and with terror, are attempting to replace the power,” he said in Russian. The new interim Ukrainian government said it will seek extradition of Yanukovych connected to the deaths of dozens of protesters. In Crimea, gunmen wearing unmarked military uniforms patrolled two airports, allowing commercial airlines to take off and land, and passengers to continue their travels. One man told the Associated Press that the men were part of the Crimean People’s Brigade, a self-defense unit intending to ensure no “radicals and fascists” come from other parts of Ukraine. Ukraine’s new interior minister, Arsen Avakov, said on his Facebook page that “military units” from the Russian Navy fleet based at Crimea’s Black Sea port of Sevastopol were at one of the airports, which Russia denied, reported NPR. There also were reports of Russian helicopter flybys over Ukraine and the deployment of Russian tanks. Kerry said he had spoken to Russian Foreign Minister Sergey Lavrov for the second time in two days to urge Moscow to respect Ukraine’s sovereignty and that Lavrov again repeated that Russian President Vladimir Putin planned to do that. Meanwhile, Swiss authorities have launched a money-laundering probe of Yanukovych and frozen his assets in Switzerland while the investigation proceeds. Resource: The Associated Press is keeping track of recent key political events in Ukraine.